This object originated from an assignment Cummings gave to his design students based on "things or events to which there is an emotional response, but which is also difficult to explain." He describes it further: "The students were asked to write about a magical event in their lives... [and] bring together concept of a magical event or emotion, then design and produce a visual object that expressed the essence of their own personal magic." It propelled Cummings to create a series of works referred to by collector Irving Lipton as "Magic Wands." 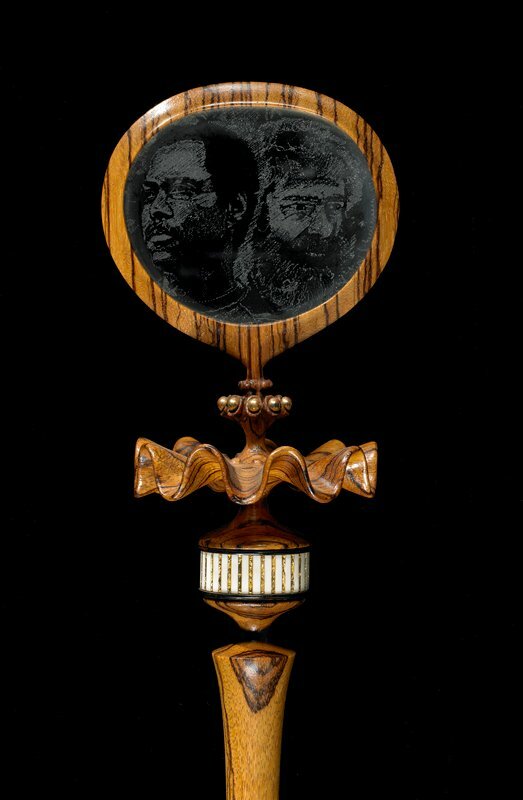 This one depicts Cummings on the right and wood turner David Ellsworth on the left, signifying Ellsworth's role as a mentor. His highly-ornamented style of wood art, accented by precious materials, adds to the power of this piece.